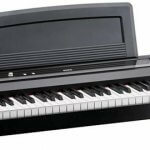 Digital pianos can be a great stepping stone for the acoustic instruments. They cost less and usually take up much less space by comparison. When buying a piano for your child most of the same factors that need to be considered for an adult still hold true. The difference lies in the fact that certain factors need to be tailored for use for a smaller child. 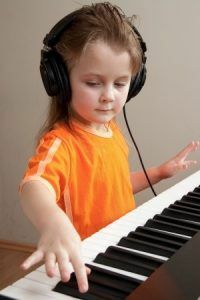 When buying a digital piano for your child avoid worrying about getting the most advanced features unless they will be needed for the child’s playing experience. 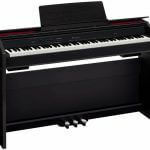 As any digital piano buyer would do, you should start by researching pianos before going to bring one home. If your child has an instructor, it may be best to rely on his or her recommendation when considering which instrument to buy. If not, ask around for friends or associates that play piano if they can recommend a digital instrument. You may even take them along when going on the hunt to purchase the final choice. If you have no other players with whom to consult about the matter check reviews online. 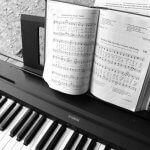 Digital piano users often leave reviews about their purchases and the experiences they have had with their own pianos. Rely on those and expert pianist opinions if you know no one that can personally guide you to one. When going on the hunt it is best to actually play the pianos to get a feel for them before making the final decision. 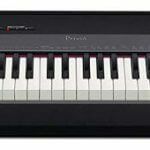 A good digital piano will provide a realistic weighted action to simulate the resistance provided by an acoustic piano. This effect is necessary in order to learn the proper technique and finger strength that is needed to graduate into playing the acoustic. Weighted action will also be needed if your kid plans to practice or perform many Classical pieces. Also necessary is a full keyboard. 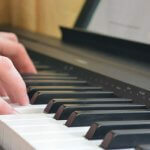 Some pianos will have less but you should look for an instrument with 88 keys in order to play the most famous pieces and to allow versatility. One of the most important differences in buying a piano for a child is the fact that the child’s size and comfort must be taken into consideration. The child’s hand and finger length, height and arm length will affect the size of instrument he or she will be able to comfortably play. Also important is the size of the instrument in relation to the child’s surroundings. If the piano will be placed in the kid’s room it should be small enough to allow space for the child to sit upright with arms and feet in the proper playing position. If you need to keep the playing environment quiet, be sure to use headphones that provide a comfortable fit.